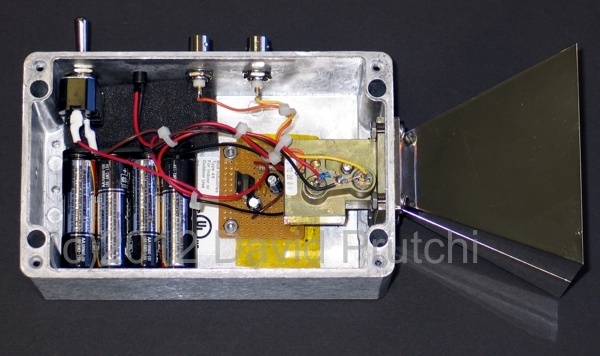 This is an inside view of our X-Band Gunnplexer transceiver (book‘s Figure 12) that should help you build your own units if you follow the schematics shown in the book’s Figure 11 . It is used throughout Chapter 1 for experiments in microwave optics, in Chapter 6 to measure single-slit diffraction, and in Chapter 7 to experiment with Quantum Tunneling. After much searching online, I found 2 gunnplexors by C & K systems in Portugal on Ebay. The trick was to look for ham radio items. I paid $16.00 each, he had two left as of october. Now if I could only be absolutely positive I have the connections right for the Gunn diode and mixer on the gunnplexors. I could find no mention of these particular gunnplexors on line, C & K may still be a security company with no online presence. looking inside the gunnplexor body, just inside is a barbell appearing metal tube approx 3 mm diam with thicker end pieces. There is a resistor and Zener diode linking this terminal to ground. This is the Gunn diode?